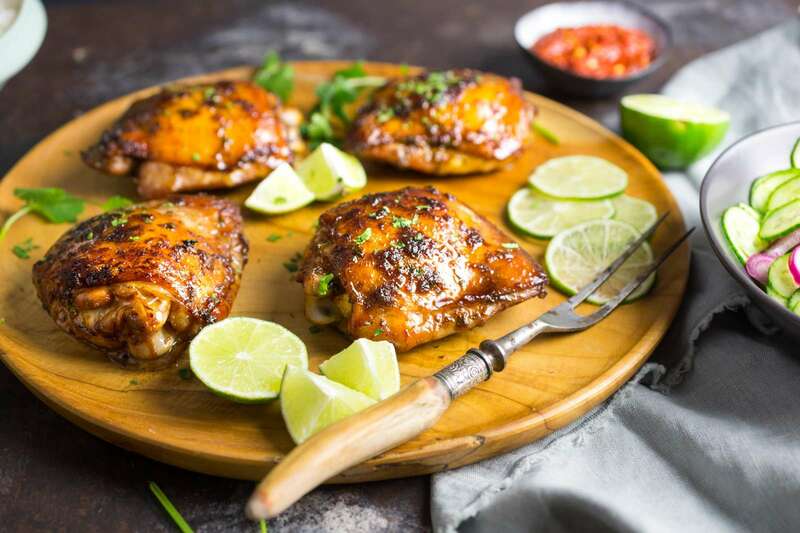 Vietnamese-style baked chicken; Chicken thighs (or breasts) marinated in a mixture of fish sauce, sugar, herbs and lime juice and then oven-baked to create a dish infused with flavor and browned to perfection. Baked marinated chicken is one of our favorite weeknight dinners. What’s that – just mix up some spices, soak chicken thighs in it for a half hour, and then stick it in the oven? Sign me up. The more interesting the flavors, the more it’s a miracle that such a straightforward process can result in a delicious dinner. And so it is with this Vietnamese-style baked chicken. 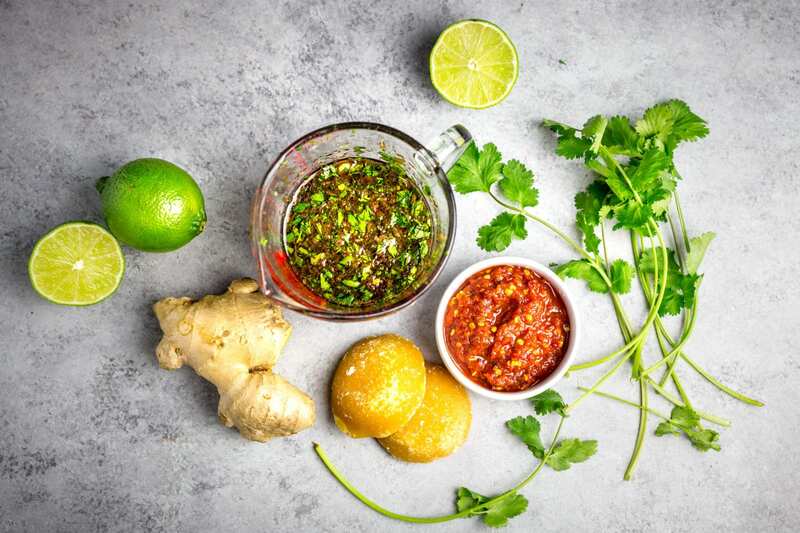 There’s a lot going on in the marinade, but one of the standouts – possibly even the key ingredient – is the anchovy-based Vietnamese fish sauce, or nuoc mam. If you’ve never encountered it, you’ve got a treat ahead of you. This sauce is used as a dressing or dip (for example, as an accompaniment to spring rolls) but we actually use it all the time, even in non-Asian recipes, where we want to add a little salt and that distinctive fishy, savory note. Along with rice vinegar and sesame oil, it’s a great condiment to have as part of a simple Asian pantry. Lime, ginger, palm sugar, chile sauce, cilantro and fish sauce. Quick enough for a weeknight dinner – this marinade gets the job done in record time. We’re also using palm sugar to sweeten the marinade and lend the chicken skin a beautiful golden-brown color during baking. It’s a traditional ingredient in Vietnamese cuisine, but it may be hard to find. If you are able to obtain it, you’ll find that bricks of palm sugar are usually rock-hard. You can grate it for recipes that need just a little (we recommend using the wide shredders of a sturdy box grater), or you can use a whole brick by softening it for a few minutes in hot water. If you can’t find palm sugar, you can substitute dark brown sugar. 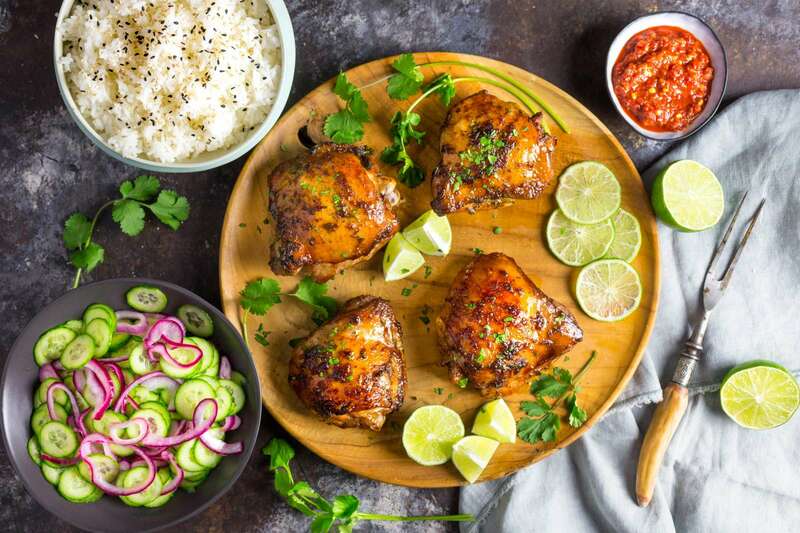 Serve this Vietnamese-style baked chicken with extra limes, cilantro, steamed rice and mixed quick pickled cucumbers and red onions. 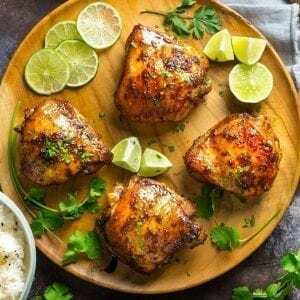 The key to understanding marinades is knowing that they mostly don’t penetrate deeply into the meat; it’s little more than a surface treatment. Because of that, a half hour of marinating time is more than enough to get the flavor into the chicken thighs. You can leave them in for up to four hours, but any longer than that and the acid in the marinade could start to make the meat mushy. Once it’s fully marinated, take the chicken out, shake off any excess liquid (but don’t rinse it off! ), and bake it, skin side up, in a hot oven. You should check the temperature at 30 minutes, and make sure it’s at least 155°F (68°C) on the inside before you pull it out. If you like, you can add a broiling step at the end to enhance the color and crispiness of the skin, but take care not to let the sweet marinade burn. 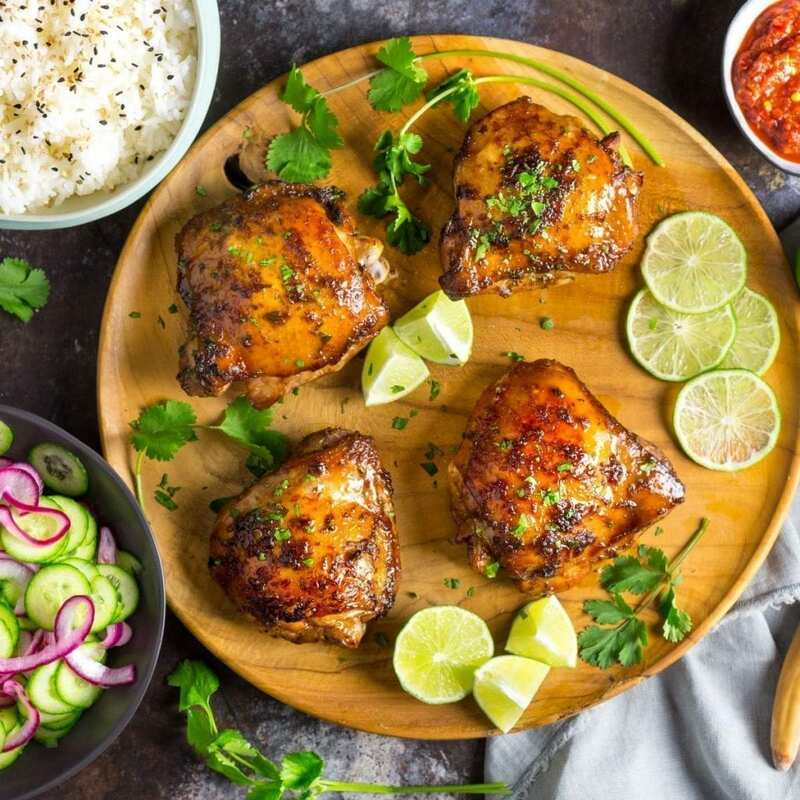 While the chicken is baking, get your sides ready – we like to make this with simple steamed rice and a salad of quick-pickled cucumbers and red onions. And hey, if you want to sprinkle a little more of that fish sauce over the plate, we won’t tell. It’s special stuff. 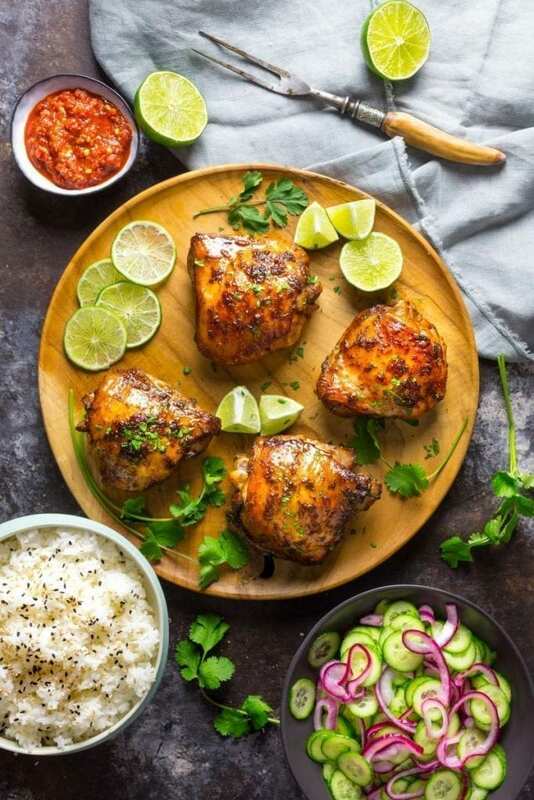 Lime, ginger and fish sauce form the classic core of the Vietnamese flavors; A short marinade with strong flavors gives the chicken the perfect tang; Ideal for either oven baking or grilling! Place thighs in a large zipper-lock bag. In a medium bowl, whisk together soy sauce, fish sauce, sugar, ginger, chili-garlic paste, lime juice, lime zest, garlic, cilantro, and oil. Pour marinade into bag with chicken, seal bag, and toss to coat well. Let chicken marinate for at least 30 minutes and up to 4 hours. Preheat oven to 425°F (218°C) and set oven rack to middle position. Line a rimmed baking sheet with foil and place a wire rack on top. Remove chicken from bag, allowing marinade to drip off, and set on wire rack skin side up, making sure to leave space between thighs. Discard marinade. Bake until thighs register 155 to 160°F (68 to 71°C) on an instant-read thermometer, about 35 minutes. (Be sure to measure temperature in the center of the thickest part of the thighs, but not directly against the bone.) If chicken skin is not brown and crisp enough by the time the thighs are cooked through, turn on oven broiler and broil until browned and crisp, about 1 minute, being careful not to burn the skin. Transfer chicken to a platter and let rest for 5 minutes. Garnish with lime slices and cilantro, then serve. Mmmmm this chicken looks finger-licking good! So many incredible flavors in the marinade! Making this now and whew! That fish sauce smell is STRONG. Did you experience that overpowering your kitchen? I have a small NYC apartment but great ventilation, so I have a hard time believing it’s an oven/vent issue. Hmm, what brand fish sauce are you using? Ours smells a bit if you sniff the bottle but doesn’t really stink up the kitchen. Our kitchen smelled of baked chicken more than anything else. Emily, hello. If your fish sauce smells bad that is exacyhow it should smell. Awful! But It’s taste in your cooking tastes nothing like it smells. It is not a bad bottle. You are basically consuming ransud fish extract but as u said it is as it should be. Do not worry. No one will get sick off of it! Emily, hello. If your fish sauce smells bad that is exacy how it should smell. Awful! But It’s taste in your cooking tastes nothing like it smells. It is not a bad bottle. You are basically consuming ransid fish extract but as I said, it is as it should be. Do not worry. No one will get sick off of it! Can I use chicken drumsticks or leg pieces instead? Thanks! Hi Sara, yes drumsticks will work really well. Depending on their size, they may cook a little faster. Can you leave out the fish sauce? Hi Carla, fish sauce is really what makes this marinade “Vietnamese”. You could substitute soy sauce and though it would be a very different dish, it will still be very tasty. I don’t have lime, can I use lemon? Love the interplay of flavors in the marinade. Used more lime, garlic, and ginger and doubled marinade, keeping half to add to chicken thighs when eaten. Basically cooked (skin came out nice and crispy! ), And frozen for later use as I am single. Recommend no salt needed. Could consider more brown sugar. Will make again. So much leftover marinade. Rather than discard what about using it to coat potatoes for roasting, mayub e with a little more oil to help it stick better to the spuds? Hi Bill, you could add the marinade to a small saucepan and bring it to a full boil. Then reduce to a simmer and cook it for a few minutes (five should be plenty). Then you could use it as a sauce for the chicken, or add it to potatoes for roasting (great idea!). I would par-cook the potatoes first and only add the sauce for the last 10-15 minutes of roasting to ensure that the sugar in the marinade doesn’t burn. Let us know how it turns out if you give it a try!